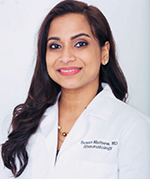 A native of the Houston area, Dr. Mathew was thrilled when she was able to come back to her community and start her practice. Her ultimate goal is to help people achieve their functional goals and live a better quality of life. She completed her residency at Allegheny Health Network in Pittsburgh, PA and fellowship at Geisinger Medical Center in Danville, PA. Both of which are clinical campuses of Temple University. She is active in multiple professional organizations including being a fellow of the American College of Rheumatology, Texas Medical Association, and the Fort Bend Medical Society. In her spare time she enjoys spending time with her family, being outdoors, and activities such as yoga/tennis/zumba.